Welcome to Flagstaff Website Design! Need a website? Have a website that needs re-designed? Whether you need website design in Flagstaff or anywhere in the world we can help! Have a site that needs search engine optimization? We offer all things related to your site from design to e-mail at your domain. 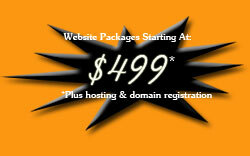 We use the most affordable quality hosting available that integrates all your tools into 1 place. Give us a try and see what Blazing Technologies (a Eozzo Company) can do for you. Click to contact Blazing Technologies at Eozzo.com. Eozzo pronounced Yö'zö has been offering website design in Flagstaff since 1998. We only use web friendly and most importantly user friendly designs. What good is your website if no one can find anything. With our experience in web site design, we know what works and what doesn't. Flash is available but not recommended. A lot of devices including phones and the iPad don't support flash as well as search engine robots. As mentioned we want your website accessible to as many people as possible across several platforms and browsers. Speaking of viewing you website on different browsers, did you know Internet Explorer isn't the only browser people use. We generally check your website compatibility with Internet Explorer, Mozilla Firefox, Google Chrome and Apple Safari.